Lulu Girls High School (LGS) is a joint project with the One World Foundation from Oldenburg, Germany. The foundation acquired a plot of land in 2006 and funded the construction of a school. The ownership of the property and the buildings remain with the foundation, Mekaela Academies has a long term lease for the property (at a symbolic price). At the end of 2007, the school was first founded as a primary school under the name “Heshima Primary School”. Around 320 boys and girls were taught in eight classes, about half of them were housed in the boarding area. On Easter 2015, Heshima Primary School and the neighbouring Manuel Alexander School burned down almost completely, only the boarding area of Heshima remained intact, because the buildings had iron sheet roofs instead of the previously used makuti roofs which are made of palm fronds. Thanks to generous donations, the schools could be rebuilt within just three months. 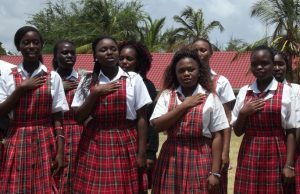 The reconstruction also offered an opportunity: Mekaela Academies only had one secondary school (Lulu High School) with a maximum of 240 places available, and that school was mixed. Most Kenyan parents prefer girls only and boys only schools for their children, so we were able to use the reconstruction to convert the Heshima into a secondary school for girls only. Since 2016, Heshima is called “Lulu Girls High School”, and the first secondary school has been renamed to “Lulu Boys High School”. Neither the boys nor the girls were willing to surrender the name prefix “Lulu” (“gemstone” in Swahili). 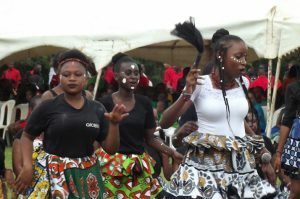 At the end of 2017, the final exams (KCSE) for the girls of Form 4 took place for the first time, and our young ladies produced quite remarkable results. There is a healthy competition between the Lulu Girls and the Lulu Boys, each graduation class wants to finish better than that of the sister school. Since their segregation the boys and girls are much more relaxed and productive. Now what may be the reason for that one wonders? 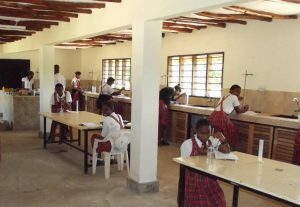 In 2018, we managed to complete a physics lab and a chemistry lab thanks to a donation of HelpAlliance, the CSR entity of Lufthansa. The old chemistry lab was changed into a library. Also, an One World Foundation funded a new administration block which contains an office and a computer lab. LGS now has all facilities a good secondary school requires – oh, wait a minute, maybe a sports pitch for the girls would make everything perfect. But them, that is already on the wish list of One World.